Giorgio Armani was born on 11 July 1934, in Piacenza, a town in northern Italy, and is of Armenian-Italian descent through his father. He is known world-wide because he is undoubtedly one of the most successful and famous designers of all time, and unusually best known for his men’s fashion collections. Giorgio Armani net worth comes from his numerous design lines as well as a retail shop network that he owns in 37 different countries. Worldwide sales of Armani products generate revenus of as much as $2 billion a year. With these numbers in mind it is easy to imagine how rich Giorgio Armani is, now that he is over 80. So just how rich is Giorgio Armani? Sources estimate that the Italian fashion designer has an enormous net worth of $10 billion, accumulated during his more than 50-year career in the fashion industry. Giorgio Armani initially aspired to a career as a doctor, and in 1950 he enrolled in the University of Milan to study medicine, three years later joining the army as a doctor and working in army hospitals. However, in 1957 he decided to change his path, and took a job in a department store. His first job there was as a window dresser, but soon he was appointed as a seller in the store’s menswear department, where he had his first lessons about the fashion industry. Armani’s career as a menswear designer began in the mid-1960’s, when he was employed in the Nino Cerruti company. In 1973 Armani together with Sergio Galeotti (originally an architectural draftsman) opened a design office in Milan. For more than a decade Armani worked as a freelance designer for different fashion houses, until in 1975, again with Galeotti, he established his own label called Giorgio Armani S.p.A, with funds raised by selling their car. In the same year he presented his first menswear collection, which was not only the real start to his net worth, but the beginning of an extremely successful career, reaching a top point in 2001 when he was recognized as the most accomplished Italian designer of all time. Giorgio Armani’s net worth earned from his fashion empire leaves no space for a doubt. Armani is best known for his suits (he is even referred to as the king of suits) and other ready-to-wear menswear, characterized by tailored, clean lines. However, he is often described as a perfectionist and a visionary, innovative creator, so that the list of the products he designs and markets is much longer and comprehensive. Women’s fashion lines as well as both male and female haute couture line, watches, cosmetics, shoes, even TV and ‘phone also carry the Armani brand name. In addition Giorgio Armani is also a businessman as he owns several cafes, a nightclub, restaurant and a bar. His newest big purchase is now called the Armani Hotel at Burz Khalifa, Dubai, known for being in the tallest tower in the world, as the most expensive. He also owns another hotel in Milan, called Hotel Armani Milan. Naturally all these businesses, together with his more than 60 boutiques and other outlets around the world, have helped increase Giorgio Armani’s net worth significantly. Armani is also involved in art and sports. He especially likes to work in the field of cinema: starting with the movie “American Gigolo” in 1980, he has worked as costume designer on more than a 100 films. 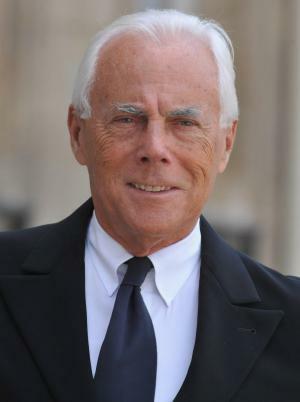 In his personal life, Giorgio Armani is an intensely private man, but has publicly identified as being bisexual, and had a longstanding relationship with his business partner Sergio Galeotti, who died of AIDS-related complications in 1985.